Max’s knows a thing or two about mass gainers with their Super Size weight gainer being one of the most popular supplements in the category. The one supplement though that has really eluded their range is an ultra high calorie mass gainer, until now. Introducing Max&rsquo;s Absolute Mass, their dedicated supplement for hard gainer’s everywhere. We take a look at the formulation, what’s good, what’s bad and see if it stacks up to Max’s reputation. Added recovery components including glutamine, branched chain amino acids & vitamins and minerals. Each 200g serve, when mixed with milk provides 1180 calories, 60.8g of protein, 153.9g of carbs and 36.47g of fat. Without the full cream milk, you’ll be getting 825 calories, 42.3g of protein, 122.4g of carbs and 18.97g of fat. Max’s Absolute Mass is a very similar formula to their other mass gainer Clean Mass, so you know you’re getting a good range of protein and carb sources. Max’s have incorporated an improved, sustained released blend of protein, which will help deliver amino acids to the muscles for as longer period of time. This helps to sustain growth processes and results in a better lean muscle gains over the long term1. 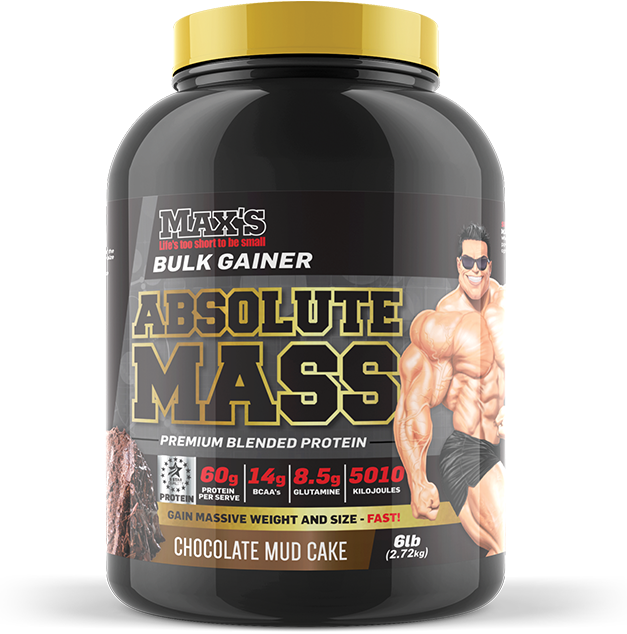 Unlike their previous mass gainers, the Absolute Mass contains a blend of 6 different carbs, which range from slow to fast absorbing sources of glucose. The benefit of having a sustained release carb blend is its ability to avoid any massive increases and drops in blood sugars, which can often leave your irritable and lethargic. The second benefit is that is helps to sustain an anabolic, muscle building environment over a longer period of time. In other words, you’re helping provide your body with the nutrients it needs to actively build muscle for a prolonged duration for improved growth. Finally, Anabolic Night’s Mass Support Matrix contains a range of excellent ingredients to help speed up recovery, which is important since you’ll most likely be training harder during your bulking and mass gain phase. The addition of conjugated linoleic acid (CLA) in this complex also helps to ensure that the bulk you are putting on stays more towards lean muscle rather than fat gains2. In terms of negatives, two things stand out with Absolute Mass. The nutrition label, which presents the macros as a serve plus whole or full cream milk. For those who don’t read the label too carefully, the inflated figures due to the presence of milk can be seen as misleading. The only other issue is that there’s not a whole lot of difference between Absolute Mass and Clean Mass, so really you could get away from using either of the supplements. Having said that, both the Absolute Mass and the Clean Mass are quite well formulated with a range of robust ingredients. Absolute Mass from Max’s currently only comes in two flavours including Chocolate Mud Cake and Vanilla Ice Cream. Both flavours are fairly innocuous and inoffensive and should please most trainers; even those with extremely picky tastebuds. The shake mixes extremely easily with very little residue and clumping, which is important since the last thing you want is to have a 600mL shake which is still powdery. Max’s has always been great with their flavouring technology and Absolute Mass is a testament to their abilities on this front. If you’re a hard gainer looking to gain some size quickly, but without wanting too much fat gain, Absolute Mass from Max’s is a good option. It’s packed with a sustained release blend of carbs and protein that maintains anabolic growth processes over a longer period of time and helps to ensure that all the nutrients are being utilised for growth rather than being potentially stored as fat. Max’s has spent awhile formulating this product and it definitely shows off the research and effort they’ve put into the supplement. Overall, it’s a decent weight gainer that should get the job done. 1. Reidy PT, Walker DK, Dickinson JM, Gundermann DM, Drummond MJ, Timmerman KL, Cope MB, Mukherjea R, Jennings K, Volpi E, Rasmussen BB. ‘Soy-dairy protein blend and whey protein ingestion after resistance exercise increases amino acid transport and transporter expression in human skeletal muscle.’ J Appl Physiol (1985). 2014 Jun 1;116(11):1353-64. 2. Churruca I, Fernández-Quintela A, Portillo MP. ‘Conjugated linoleic acid isomers: differences in metabolism and biological effects.’ Biofactors. 2009 Jan-Feb;35(1):105-11.